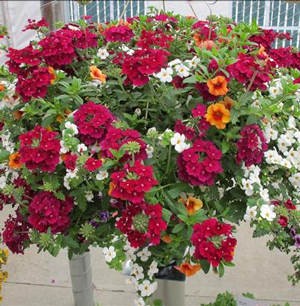 Our Confetti Garden™ 'Mambo Beach' Flower Combination is a mixture of Bahia White Night Bacopa, Empress Flair Burgundy Verbena and Aloha Tiki Orange Calibrachoa. The flowers in this collection have all been bred by Dummen, experts for more than 40 years, and are bred for their larger-than-average blossoms, vigorous growth habit and luxuriant, tropical colors. 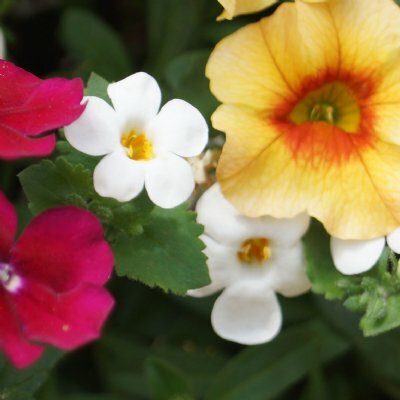 Our 'Confetti Garden Mambo Beach' plants are grown and shipped in fine quality growing medium and are guaranteed to arrive alive and ready to thrive. "makes me feel like I am on the beach"
Comment: Confetti Garden Mambo Beach Flower Combination looks great with my Tropical Canna. Comment: What an amazing combination of flowers! Looks like a wedding arrangement for a bride!! Arrived in perfect shape! Can't express how lovely this is! Highly recommend! !